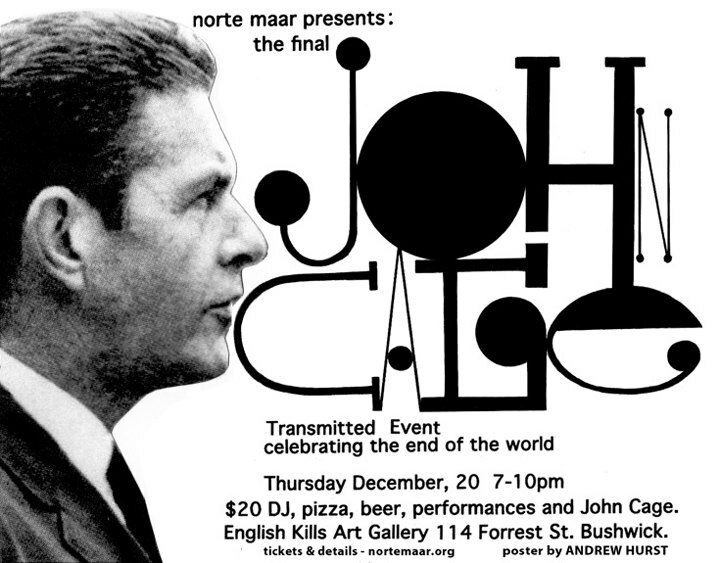 For Norte Maar, year 2012 will forever be connected with John Cage, and the 100th anniversary of his birth. A year ago, Bushwick’s premier non-profit for arts joined the world movement to celebrate the life and work of one of the greatest composers and artists of the 20th century. Monthly events dedicated to John Cage speaking a number of artistic languages has been titled Cage Transmitted: 12 evenings of performance. In creating the series, Norte Maar collaborated with Experiments in Art and Technology (E.A.T. ), namely with its leading figure, legendary Julie Martin. Lectures, poetry, ballet, electronic and classical music, Norte Maar has not only ventured across the boarders of the artistic disciplines but also far beyond the boarders of Bushwick. They have introduced a night of Cage at Dumbo Arts Center; at Park Avenue Armory or at National Academy Museum. Norte Maar has been consistently proving, and the Cage Transmitted series has only confirmed that they have branched out from Bushwick and became a strong voice on the New York art scene, and thus fulfilling the Bushwick ideal – developing a successful home base for arts on an alternative basis outside of the old structures; in a small scale reaching a large audience and importance in New York. We took a moment to reflect on the Cage Transmitted series as it reaches its final installment this Thursday at English Kills with curator Jason Andrew and choreographer Julia Gleich from Norte Maar, as well as with Julie Martin from E.A.T. 1. One year is a very ambitious duration for an art project. How did you feel in the beginning? Jason Andrew: The Cage Transmitted series was planned as a monthly celebration of the centennial of John Cage’s birth, but once we got started, there were so many great people and ideas generated that we couldn’t limit it to just once a month. But we can’t talk about Cage Transmitted without Julie Martin, director of Experiments in Art and Technology (E.A.T.) and our collaborator on the series. Julie was a driving force behind many of the year’s events. Personally I have been longing to work with her for a number of years. Cage Transmitted turned out to be the perfect opportunity. Julie really kept us focused. When we were worried about spreading ourselves too thin, she suggested another program! And when I was concerned about an audience she said, “It doesn’t matter how many people show up, it just matters that you did it.” That’s kinda my new mantra! Julie Martin: I was interested in working with Jason and Norte Maar because of the wide scope of artists and events that he had been associated with. I was particularly interested in having lectures and performances that addressed areas of Cage's ideas, interests, and works that would be new and surprising and keep the dialogue with Cage going into the future. Julia K. Gleich: You see, we began with some humble plans for collaboration that exploded into projects that led to collaborations not only with many artists but also amazing organizations like Harvestworks, Dumbo Arts Center, Triple Canopy, New York Center for Art and Media Studies, Park Avenue Armory and Trisha Brown Dance Company, the National Academy Museum, and for the final event will return to Bushwick at our friends, English Kills. 2. And how do you feel at the end? Were your expectations met or was it a big surprise for you? JA: I believe it exceeded our expectations. We had no idea when we started, what a great forum and following we would develop and how many new artists we would discover. Very early on Julie introduced us to John Driscoll, who was close to David Tudor. John became our resident sound engineer for the series acting as our consultant to all this new sound media. We really couldn’t have done many of the experimental sound performances without him. And he’ll be with us for the final Cage Transmitted event on Thursday. There were so many people that were instrumental in furthering the series it’s hard to acknowledge them all. JKG: The types of events were so varied, including dance and music, artists and writers, talks and poetry. I was jealous to not have seen the talk by the legendary Simone Forti and performance by experimental musician Atau Tanaka. But I did spend a fun day dancing in the Museum with Sara Rudner. JA: Exhausted? Heavens no. Just like the I Ching, there are endless possibilities. JKG: What’s the Latin word for 101st? JM: I still have a few ideas up my sleeve! 3. Which one of the individual events meant the most to you? JKG: Probably the Cage on Vinyl on Marley event at the National Academy Museum. 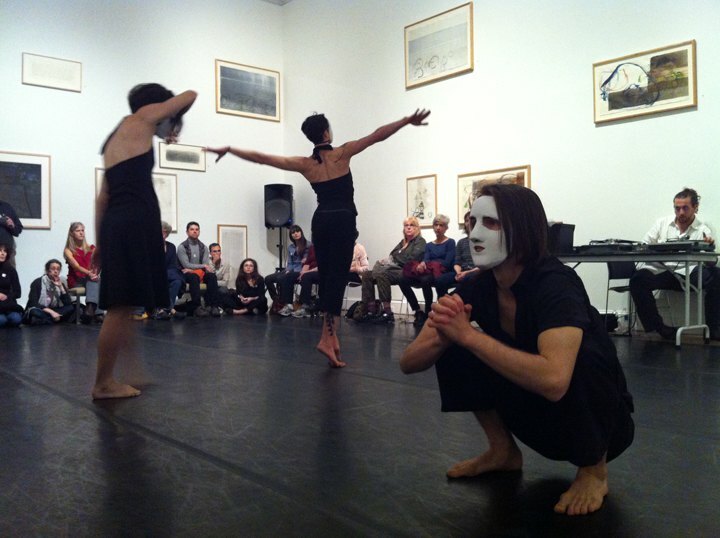 It was Norte Maar’s first museum collaboration and the first ever dance collaboration at the museum. I curated and programmed all the dancer/choreographers and felt so privileged at the quality of the artists who accepted our invitation. Choreographer, Douglas Dunn was actively involved in this collaboration and we were thrilled to work with him too. But it was probably when our friend the curator of Contemporary and Modern Art, Marshall Price, came into the gallery excited by the queue outside his museum that made that day most memorable! We all felt privileged to be in the museum space surrounded by the spectacular exhibition of John Cage’s works and the buzz of all the different performers coming into the space! JA: I’d have to agree with Julia. Cage on Vinyl was too much fun! But I’m also quite fond of the performances in the front room of Norte Maar. 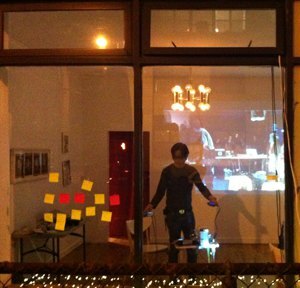 Our first Cage event took place there with the audience watching outside from the street through the windows. Our Robert Whitman event presented in collaboration with Triple Canopy was also one to remember. My gosh there were so many great events! JM: I loved in general, the performances by younger artists like Stephen Vitiello, Atau Tanaka, the Irish group Strange Attractors with their amazing durational sound performance, the collaborative performance put together by electronic musician Lesley Flanigan that included Maria Chaves and MV Carbon. But most of all the enthusiastic energy and can-do attitude of my collaborators Jason and Julia. 4. Julia is based in London. Jason in Bushwick. How does a long distance collaboration London-New York work for you, guys? JA: The long distance collaboration has it difficulties but we happen to love Skype and spend many hours working together on it. Julia has met many a new artist through sitting on Skype with me. JKG: While it would be nice to be here in person, I am able to come back frequently enough, that we have done more dance projects this year. Including CounterPointe with Brooklyn Ballet, which by the way included a tribute to Cage, Cage on Vinyl on Marley, CO-LAB at Dumbo Arts Center, the first Cage Transmitted in the apartment gallery and of course The Brodmann Areas in April. It has been a very full year for dance. Much of the preliminary work can be done through e-mails and we take turns setting up face-to-face meetings for each other with potential artists and collaborators. JA: I love to interact with all the artists and partners in collaboration and I keep Julia in the loop about everything going on, but we support each other and also know each other’s strengths and areas of expertise. Sometimes the best collaborator is someone who you can bounce ideas off. And speaking of that, Julie Martin has played a huge role. We had regular phone meetings. She is an endless supply of ideas and she lives in New Jersey. So it is a triple long-distance collaboration. 5. And the last one: what does John Cage mean for you? JKG: Jason recently wrote that John Cage was trying to eliminate his own ego from his process and in doing so freeing sounds to be themselves. I like this idea and find it difficult and perplexing too. But if anything, I want Norte Maar to have an open embrace of dance ideas and not be stuck in elitist, traditional or otherwise expected modes of presentation. I like to think that with Norte Maar anything can happen. 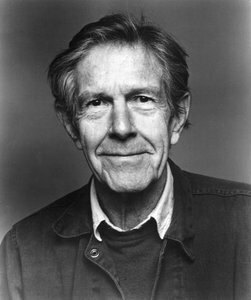 JA: John Cage means endless possibilities and the many countless variations between. JKG: Cage is a way of inviting everyone into your aesthetic where nobody is and everyone is.